Sounds like a new style of eye makeup. An article on CNN.com, "This is what 'whitelash' looks like," explains that the term refers to the white backlash that historically has occurred after every era when progress against racism has been made. I wasn't aware of this historical pattern before reading the article, but in thinking about it now it's fairly clear. Reconstruction after the Civil War, the post-war era from 1865 to 1877, was a time when former slaves gained more influence in the country. The article's author, John Blake, says that a century of Jim Crow followed the Reconstruction. He continues "The civil rights movement of the 1950s and '60s was followed by President Ronald Reagan and the rise of the religious right." The article was also enlightening for me regarding Obama's presidency, the he isn't "post-racial" but "post-Reconstructionist," with Trump's election echoing the whitelash that occurred in the fourth quarter of the nineteenth century. Hm. It's difficult to analyze history while one is in it. My own belief, actually deeply held, is that the outcome of the Civil War was the wrong one. There should be, right now, a nation called the Confederate States of America existing beside the USA as peacefully as Canada does. How hard is that to visualize? Crossing the national boundary into the CSA and back again would be no more difficult than entering Canada from Washington State. "Anything to declare?" As it is currently, those we identify as Southerners, which is a term becoming increasingly diffused as that population moves around, also deeply hold the belief that the outcome of the Civil War was the wrong one. 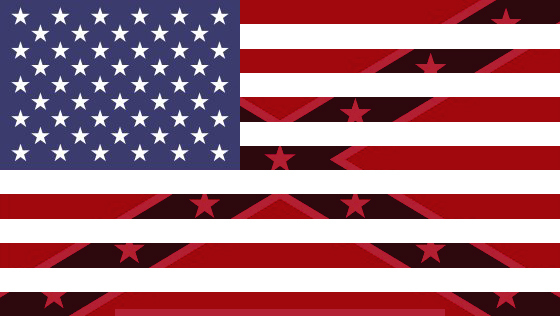 For many of them, now, their experience is that they have a dual citizenship, because many believe deeply, down where God and love and country reside, in the deepest part of the heart, that the Confederate States of America was never completely dissolved and still exists in spirit. Evidence of that is the number of Confederate flags currently flying. Dual citizenship is obviously okay and a lot of people are in that situation. The problem comes in when those citizenships conflict. If citizens of the CSA feel that the spirit of the CSA is embedded within the definition of the USA, then they're patriotic for and fiercely supportive of the USA. But if the USA is defined as a forward-thinking nation whose responsibilities and privileges relate equally to all her peoples, their CSA citizenship takes precedence. And actions that could be considered treasonous in one nation may be considered heroic in the other. The problem of conflicting allegiances probably can't be solved. The constitutional, legal, financial and logistical hurdles keeping the Confederacy from peacefully, bloodlessly seceding from the US now are probably insurmountable. But I can't think of anything that would generate more euphoria among Southerners, especially the straight white Christian blue-collar males who are diehard Trump supporters, than the South actually rising again. Even the return of Jesus in glory wouldn't be quite as exciting for them as the Confederacy peacefully, legally becoming a real entity. If SWCMs feel disenfranchised in the modern world of immigration, workplace equality, and automation, finding a way to make the Confederate States of America a reality—without bloodshed and with the assistance of legal professionals all the way up to the Supreme Court—would give that whole population something to focus on and work toward, a monumental, historic effort in which to take great pride.